Here's my Yule log. It's wider on the right, tapering to the left, resembling a "Tannenbaum" on its side. Those are Ancestral Path Tarot cards in the back. Can you identify them??? The only other decorations are ribbons and wishes. My father-in-law drilled the holes for the candles. I really hadn't thought it possible to include my husband in commemorating the solstice, but he came in in the evening and asked, "Okay, what do we do with this?" Since we had three candles, and two people, I told him we could each make a personal wish and together we would make a universal wish. I believe that secrecy gives extra power to a personal wish. For one thing, a person is freer to wish for their heart's true desire! So, after writing our wishes, we tied them (triple knot) with red ribbon. Maybe you can see the one by the white candle. Seems like during the whole Yule season--the when and how of which varies by tradition/religion/culture--the solstice is a focal point. 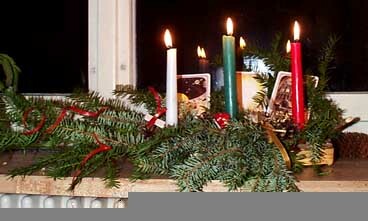 While we need the lights/greens/festivities of the Yule season (especially those of us with S.A.D. ), it's still culturally variant. But the solstice itself is a single point in time--and it occurs at the same moment all over the world. It is, in reality, nothing more than the sun reaching its nadir (from a geocentric viewpoint, anyway). It's a good time for synchronized prayer/meditation, which I know for a fact occurs. Too bad the solstice was at nearly 3 a.m. my time!